Are you in need of a furniture logistics company and only want to work with the best? Well perfect! We're glad you found us! Now let us tell you what makes us the best furniture transportation company in the industry. Operate a Large Fleet: We have over 180 trucks in the Shelba Johnson Trucking fleet to handle our pick-ups and deliveries. Top of the line Equipment: Each of our 500 trailers are air-ride equipped so that your furniture is transported as smoothly as possible. The smooth ride is one of the reasons we have a low damage rate. All trailers are also fitted with E-Track load securing mechanisms to assure loads do not shift in-transit. 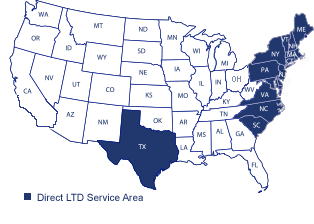 Large Service Area: Our furniture logistics services extend up and down the east coast and into some western states such as Texas and California. If you have a shipment going to a state we don't service, then we'll work with one of our selected partners to get your furniture shipment to its final place. Online Shipment Tracking: You no longer have to call the company to find out where your shipment is and when it will be delivered. We now have online shipment tracking that can be accessed 24/7. Excellent Customer Service: Our customer service team is highly trained, experienced and diligent on answering your questions when you have to have an answer. They work hard to ensure every customer is satisfied and all needs are met. Our goal is, if there is a problem, we want to solve that problem before the customer is even aware of it, being proactive instead of reactive. Committed to Our Community: Shelba Johnson Trucking is not just a furniture logistics company to our friends and neighbors in the community. We pride ourselves on taking an active role in helping to make our community a better place. If you'd like to know what local community charities we contribute to and volunteer with, go here. Don't wait any longer to see why we're the best furniture logistics company. Go ahead and request a free quote for your next shipment! We'd love to have you as a customer and look forward to a long partnership.